At Last… a way to free yourself from the discomfort, embarrassment and frustration of blepharitis. HelloI’m, a programmer and trader. Five years ago blepharitis nearly ended my career and badly affected my social life. The stinging gritty eyes and tearing made it very hard to work. I also began to avoid meeting new people because of the appearance of my eyes. I saw several eye doctors who told me there was no cure for blepharitis. Also, the things they suggested to relieve the symptoms were not much help. There didn’t seem to be any real answer to the problem. Fortunately I refused to accept that. After 2 years of research and testing I am happy to tell you that there is an answer. I and others who have used my formula are now symptom free. BlephroClear is a made from natural oils, vitamin extracts and other active ingredients that improve skin health. Other ingredients used protect against micro organisms and fungal infections. There are many different factors leading to the development and persistence of blepharitis. 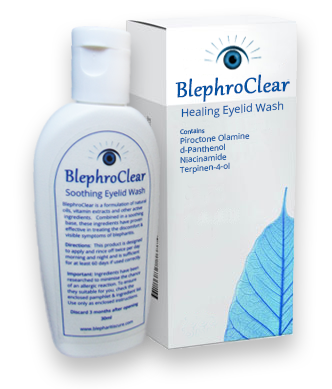 BlephroClear treats the discomfort and visible symptoms of many forms of blepharitis. Using BlephroClear is simple. Apply and rinse it off twice per day, morning and night. One bottle is enough for at least 60 days when used correctly. Ingredients have been researched to minimise the chance of an allergic reaction. To ensure they suitable for you, please check the list of ingredients on the product page. Thanks again so much for your product – it’s an absolute lifesaver! Except for a flare up around New Year (because I wasn’t so vigilant with Blephroclear) I have now been pretty much clear of the insidious blepharitis for nearly 12 months!!!!! yayyyyyy. It’s so easy to use and I’ve just been applying once a day with my evening shower – now part of my daily routine! I’ve even been able to almost completely reduce my reliance on eye drops J. You have a customer for life! Amazing product that actually works – so glad I found it! Its so good to find something that actually fricken works! The gel works really well to thanks my eyes are improving each day I use it. The rims of my eyes are less inflamed and my glands of my eyelids are less blocked so my eyes are more oily and less red and sore! Its so good to find something that actually fricken works. Thanks a lot, Josh. Thanks for your email. The reason I ordered again so soon was a cousin of mine has blepharitis as well and when he saw how I was going he took the rest of mine. It works really well thanks, I'm a happy man. Hello Raoul, I just wanted to write and thank you for sharing your blepharitis treatment, it has been a godsend. I have suffered with blepharitis for many years. Most treatments I have tried were very expensive and my condition required using them daily so it was costing me a fortune. I am now on my second bottle of Blephroclear and the bad days are getting further and further apart. What I was paying for twelve days is now giving me three months so that is a little relief for my husband as well. Thank you again. Hi I have had angular blepharitis for 3 years and it has pretty much dominated my life. I have only been using Blephroclear for 4 weeks and my eyes are so much better in the morning already. WHY SHOULD YOU TRY BLEPHROCLEAR? Unless you are already on some treatment or regimen that is helping your condition, it is only likely to get worse. So take advantage of my risk free 100% money back guarantee and try it for yourself. Want to learn everything the doctors don't know or won't tell you about blepharitis.